I have been wanting to start this series from the beginning, and finally, I renewed my card at one of my local libraries and discovered that they have them on audio via Hoopla! This was a really fun first book. 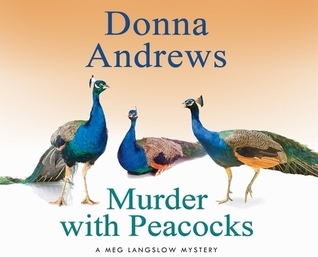 I especially loved the quirky characters in Meg's family and the fact that the mystery was set against a backdrop of wedding-related drama. The book is also really funny. I've already borrowed the second book, and I can't wait to see what happens next. Sign into Goodreads to see if any of your friends have read Murder With Peacocks.